Allinea Software is the trusted leader in software development tools and application performance analytics for parallel software in high performance computing (HPC). The parallel debugger, Allinea DDT, and the performance profiler, Allinea MAP, are interoperable, extremely scalable, capable and intuitive tools. The tools improve the efficiency and value of HPC investment by reducing development time and increasing application performance. 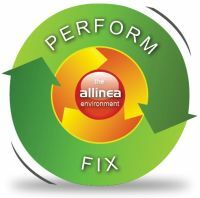 Owners and users of high performance systems use Allinea Performance Reports to improve the performance and throughput of their HPC system by analyzing and understanding the applications that run on them. At ISC14, Allinea Software revealed their vision for greener applications by demonstrating the results of joint research with the University of Warwick to investigate novel energy and power measuring techniques for scientific application workloads. New tool extensions for application energy usage optimization were shown in both Allinea MAP and Allinea Performance Reports. Find out more about their application energy optimization tools. Improving clinical outcomes with HPC is the vision of researchers at University College London. They expect that neurosurgeons will in future be assisted by HPC simulations using data calculated from a patient's MRI scan. Their modelling of intracranial blood flow reached a major milestone after enlisting the help of Allinea Software's development tools. A massive simulation using 50,000 processor cores on the UK’s largest supercomputer, ARCHER, became possible after using Allinea DDT to solve an application crash that only occurred at this high scale. Saving precious research time today brings forward the day that HPC delivers the vision in the future: A real reason to celebrate scalable debugging. Allinea Software revealed today that through its strategic alliance with Cray Inc., five of Europe’s newest multi-petaflop Cray® XC30™ supercomputers are now using the scalable Allinea DDT parallel debugging tool. As application developers stretch the limits of their scientific codes, the Allinea DDT debugger will be taking scaling in its stride: Allinea DDT architecture and graphical interface is proven in production use at scale on more Petaflop systems than any other developer tool. Allinea Software – the trusted leader in software development tools for High Performance Computing – unveiled a new tool targeting system owners and developers alike at the SC13 Supercomputing exhibition. The rise of coprocessor-based computing has caught everyone’s attention, and today Allinea Software announced the immediate availability of fully integrated development tools for applications running on the host and coprocessor. The 4.1.1 release of Allinea tools enables users to increase the performance and the success of code migration to the coprocessor by providing both debugging and profiling within the single unified Allinea tools environment using Allinea DDT and Allinea MAP. In a city where public demonstrations played a significant role in re-unifying Germany, Allinea is promoting unification in HPC software. The Beacon project at the National Institute for Computational Sciences (NICS) took a major step forward today with the news that Allinea Software’s development tools are now available on the ground breaking Intel® Xeon® Phi™ coprocessor-based system. Allinea Software today announced immediate availability of debugging support in Allinea DDT for the latest NVIDIA Tesla K20 family of GPU accelerators, based on the Kepler architecture, and the recently released NVIDIA CUDA 5 toolkit. Allinea Software today announced the immediate availability of their leading parallel debugging tool, Allinea DDT, for Intel® Xeon Phi™ coprocessors - and forthcoming support in the Allinea MAP performance profiler which was itself newly unveiled during the SC12 launch gala. Allinea Software today announced the release of its high-performance scalable parallel debugger, Allinea DDT, for IBM BlueGene/Q systems. The IBM BlueGene/Q (BG/Q) is the next generation in the IBM BlueGene family, and brings unprecedented core counts and multi-petaflop performance. A new study released today shows the market-leading debugger, Allinea DDT, is facilitating world-class research that spans the universe of scientific inquiry – everything from astrophysics to the structure of nuclei – with more computing power than ever before. The AtomicWeaponsEstablishment (AWE) - one of the UK’s most prominent centers of scientific research, are using Allinea Software’s AllineaDDT debugging tool to provide the capability needed for a new generation of science on their powerful Blackthorn and Willow Bull systems. Both the CEA and Bull have reaffirmed their longstanding relationships with Allinea Software (www.allinea.com) by choosing the company’s industry leading DDT and OPT debugging and Optimising / Profiling solutions for the International Fusion Energy Research Center (IFERC). Earlier this year the CEA (on behalf of F4E) selected Bull to provide, maintain and operate the computer that is to be installed at Rokkasho (Japan). This computer is intended to allow the most advanced modeling and simulation in the field of plasmas and controlled fusion equipment. It will be available to European and Japanese researchers for a period of five years from January 2012. With computational power from Bull exceeding that of 1 Petaflop, it ranks as one of the most powerful systems in the world. The supercomputer is an important milestone of Europe’s contribution to the Broader Approach (BA), an Agreement signed between Europe and Japan to complement the ITER project through various R&D activities which are developed in the field of nuclear fusion. Also offered as part of the bullx supercomputer suite, Allinea is able to offer their suite of interoperable debugging, optimization and profiling tools for parallel and high performance computing (HPC) on the bullx server ranges. The US Department of Energy's Argonne National Laboratory (www.anl.gov) has selected Allinea DDT as the default tool for parallel debugging on its Blue Gene (BG) and Linux Systems. Allinea DDT provides advanced parallel debugging tools for scalar, multi-threaded and parallel applications, and is acclaimed for its intuitiveness and scalability. Earlier this year Allinea announced the release of DDT 3.0 – the first debugger capable of handling applications running across hundreds of thousands of cores – needed to deliver Petaflops performance. DDT 3.0 enables programmers to increase their efficiency when working at scale. It provides an interface that simplifies the presentation of many processes by merging similarities and highlighting differences, and is an easy to use tool on 100,000 cores as well as on just 100 cores. Blue Gene is a computer architecture project designed to produce several supercomputers, designed to reach operating speeds in the PFLOPS (petaFLOPS) range, and currently reaching sustained speeds of nearly 500 TFLOPS (teraFLOPS). It is a cooperative project between IBM (particularly IBM Rochester and the Thomas J. Watson Research Center), the Lawrence Livermore National Laboratory, the United States Department of Energy (which is partially funding the project), and academia. There are four Blue Gene projects in development: Blue Gene/L, Blue Gene/C, Blue Gene/P, and Blue Gene/Q. Germany’s Leibniz Supercomputing Centre (LRZ, http://www.lrz.de) has chosen AllineaSoftware (www.allinea.com) to support debugging for the targeted large-scale parallel applications on the IBM SuperMUC system next year. LRZ, which is the computer centre for Munich's universities and for the Bavarian Academy of Sciences and Humanities, provides high-end computing facilities for the scientific community in Germany and beyond. The Partnership for Advanced Computing in Europe (PRACE) announced the implementation of the IBM system, which will comprise of more than a hundred thousand cores capable of delivering an impressive three peak petaflops/s of processing power. When SuperMUC is installed at LRZ in the middle of 2012, it will most likely be a top 10 system. SuperMUC will follow the 1.0 petaflop "JUGENE" (Jülich Blue Gene" Blue Gene/P supercomputer), already in service at Forschungszentrum Juelich (FZJ), and the 1.25 petaflop Bull-built "Curie" system at the Commissariat a l'Energie Atomique (CEA) in France. These machines currently occupy 9th and 6th position respectively on the TOP500 list. It will be one of the Tier-0 systems available in the PRACE infrastructure which provides large-scale computational resources and infrastructure for scientific applications throughout Europe. It will enable LRZ's scientific community to test theories, design experiments and predict outcomes as never before. The supercomputer will be jointly funded by the German federal government and the state of Bavaria. Mike Fish, CEO of Allinea Software, explains: “We are delighted that LRZ has chosen Allinea to handle its software debugging for its IBM SuperMUC system. Our software solutions are engineered to empower developers with the tools to fix bugs both quickly and easily, being powerful enough for the most advanced parallel programmers, but also accessible for beginners without training. In effect, we’re providing target scale debugging whether programming for 8 cores or 200,000”. This partnership with LRZ represents yet another significant deal for Allinea in the European market. Allinea Software - www.allinea.com - a leading supplier of software development tools for high performance computing (HPC), has signed a further collaboration agreement with CEA, the French government-funded technological research organisation www.cea.fr/english_portal. The aim of the collaboration to date has been to develop enhancements to Allinea Software’s market-leading Allinea DDT (Distributed Debugging Tool) for next generation hybrid and “many-core” computer systems. Based on the work carried out in phase one, the two organisations are seeking to address a major challenge and to offer a solution for large scale systems. Dr. David Lecomber, CTO at Allinea Software, explains: “Research organisations require ever more powerful computational resources, and so their software needs to run on ever larger numbers of processors. This increases the complexity and risks of errors in software development; Allinea is one of the only suppliers of tools that can handle this complexity and identify errors before they hold up important research. The focus of phase two is to make debugging tools both portable and easy to use for large scale debugging well over 100,000 cores. Allinea DDT's interface is intuitive at every scale of parallelism, and its architecture has already been shown to scale well to existing large systems. Another important aim is to improve the previous work carried out on CUDA debugging by adding more features to address the CUDA architecture and fully exploit the enhancements which NVidia now offers. Pierre Leca, head of Simulation and Information Sciences Department, CEA, comments: “We’re very pleased with the results of our collaboration with Allinea Software over the past year and we want this to continue. They are clearly an active, technology leader, with the right product already available, and unrivalled expertise in parallel performance. This next phase of collaboration with CEA is a further illustration of Allinea Software’s leadership in High Performance Computing (HPC) software with the most demanding HPC sites in both Europe and the USA. Warwick, United Kingdom – Allinea Software today announced that that it was making a pre-release version of the Distributed Debugging Tool (DDT) for the CUDA architecture available to early-adopter customers. This coincides with the release of Nvidia’s CUDA Toolkit version 3.0. Over the last year, Allinea has been collaborating with the Commissariat à l’Énergie Atomique (CEA) t develop CUDA-specific feature within its market-leading DDT product. The preliminary results of this close collaboration were shown at Supercomputing ’09, when native debugging of CUDA-enabled applications running on NVIDIA Tesla GPUs and x86 host processors was demonstrated. Following the full release of Nvidia’s CUDA Toolkit 3.0, Allinea is pleased to announce that it will be making a pre-release version of DDT for CUDA available to its customers. “We are delighted to see the results of our collaboration with the CEA making it into our mainstream DDT product,” said David Lecomber, CTO of Allinea Software. We are now able to provide application developers with a single tool that can debug hybrid MPI, OpenMP and CUDA applications on a single workstation or GPU cluster. Features such as the detection of invalid memory accesses, the visualization of GPU data, and GPU thread control have been designed to help our customers find their GPU porting bugs simply and efficiently." Allinea Software is the leading supplier of tools for parallel programming and high performance computing (HPC). Allinea’s products are used by leading commercial and research institutions across the world, and have consistently set the standard for affordability, functionality and ease-of-use – whether applied to applications at modest scale or peta-scale applications on the world’s largest supercomputers. Allinea has offices in Warwick (UK) and San Jose, USA. With new product features aimed at multi-threaded applications and novel computing architectures, Allinea is now bringing its wealth of experience in parallel tools to the rapidly-expanding arena of multi-core processing.